Dr. Jungmin Han published an article entitled as, “Do users perceive the same image differently? Comparison of OLED and LCD in mobile HMDs and smartphones” in the Journal of Information Display. The study examined which panel the consumers prefer in the smartphone and HMD context by investigating the characteristics of panels as perceived by the consumers as well as the consumers’ VR (virtual reality) material preferences. The characteristics of the different panels as perceived by the consumers were extracted, and the users’ VR material preferences were ranked. The study findings indicate that OLED should be used for HMDs to increase the consumers’ satisfaction. 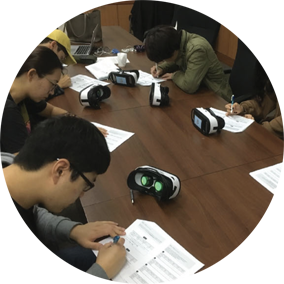 Furthermore, the users did not find any significant difference between the two different luminance values of the OLED panel that was used for the study, which indicates that the luminance of the panel can be optimized for a comfortable and satisfying HMD viewing setting.